This collection of short stories by Vanessa Gebbie is not cozy bed-time reading. Even the most apparently innocent openings--"I'm on a train going to the sea"--only mask for a short time the brutal truth that's about to be revealed. Liesl is on a train, and she's been told she's going to the sea, but the train in 'Red Sandals' has a very different destination. Gebbie gives us little slices of insights into people's lives that are often so harsh that you want to look away, but also so honest and intimate that you feel looking away would be a betrayal. From the baker returned from WWI who goes down a tin mine instead of returning to his trade, but finds that even underground he can't hide from what happened to his neighbour and fellow-soldier to the bedridden ex-soldier whose self-conceit never quite catches up with the change in his circumstances, Gebbie shines a spotlight into those places we'd rather not look. The writing is clean and to the point with few words wasted. "The sky was the deepest blue, over there above the hill. No stars. Security lights at the factories." Thus, the scene is set in 'Background Noise', where Maidie learns there is more to her grandfather's story of a daring escape from a submarine than she previously suspected. "My lips moved against the rubber. Every breath I took filled my chest with bad air. I pulled at it, tugging it back down, trying to keep it. It was mine. I was Bambrick." Like so many of Gebbie's characters, Grampa has something to hide. Out it comes, though, eventually, choking and gasping its way out into the night, as if it simply can't be held back any longer. Then we have it, the raw truth of the character's secret, exposed on the page. With this volume, small but perfectly-formed, both Gebbie and Salt Publishing cement their reputations for producing quality short fiction that demands to be read. 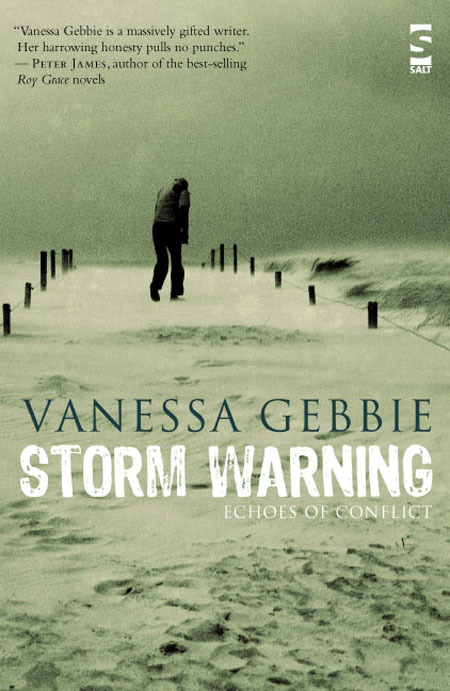 Read GUD's review of Vanessa Gebbie's Words From a Glass Bubble. Vanessa Gebbie's short story 'Jamie Hawkins' Muse' appeared in GUD Issue 2. Read a preview. The reviewer has reviewed her own copy of "Storm Warning". My cat has now destroyed my copy of 'Storm Warning'. Let this be a warning. Take your pick. Also, take the cat.